An ultrasonic blast should do the trick. Disappointment. A shape charge would have ruined the bills around the edge but it would have taken care of it. BTW: for $3M it would have been 600 stacks of $100 bills with 50 bills per stack. By my estimate only about half that could have been in the glass if it was totally full. When we went into Iraq I was part of a detail that had to move $9M out of one of the palaces. There were 3 of us and it took the better part of a day just to load the truck. 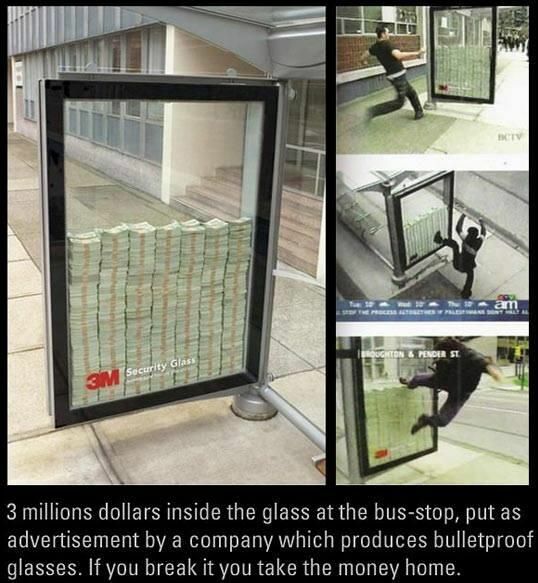 The 3m isn't million its the glass manufacture . Minnesota, Mining and Manufacturing.